This dress came about through a whole series of tear sheets I started gathering last summer. I wanted to put together color blocking and hidden pockets and create a really great casual dress for everyday wear. This is where I ended up. This dress is sort of the equivalent of wearing a slightly over-sized classic shirt. But a lot cuter. I guess this pattern is sort of the opposite of the Fairy Tale Dress because it’s roomy and relaxed and casual, like something you could pretty much live in. Which might also be why I want one in my size, since I seem to be living in over-sized men’s shirts lately. 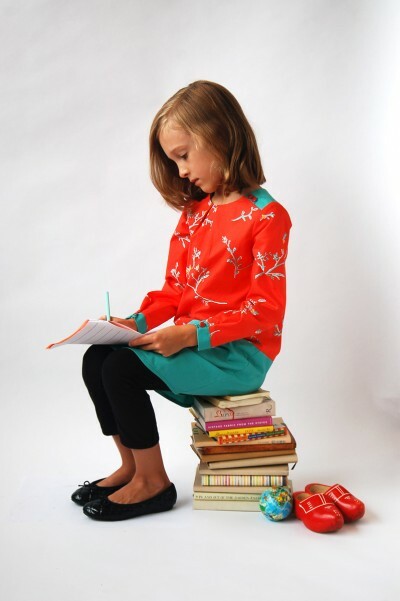 S has certainly enjoyed wearing her Book Report Dress lately. You know how much I like the fun little details. 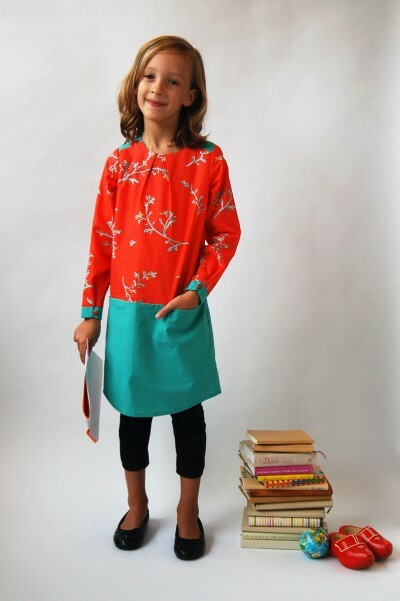 In this pattern we’ve included hidden pockets located right in the front seam, so you can color block this dress (or make it in a single fabric) and never notice that the pockets are there because of their placement. 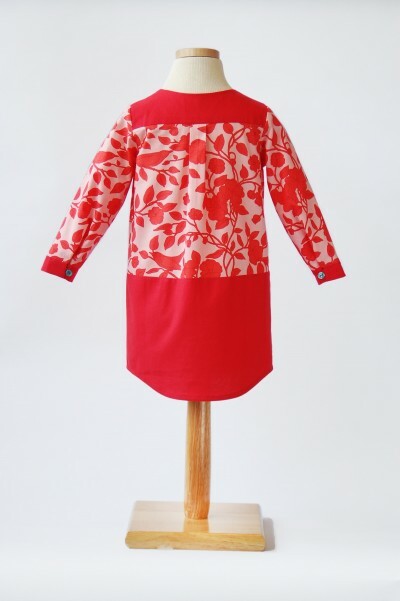 The color blocking also comes into play at the back yoke, so it shows at the front where the shoulders button with some cute little button loops. We also included two gentle pleats at the front neck for a sweet and feminine detail. 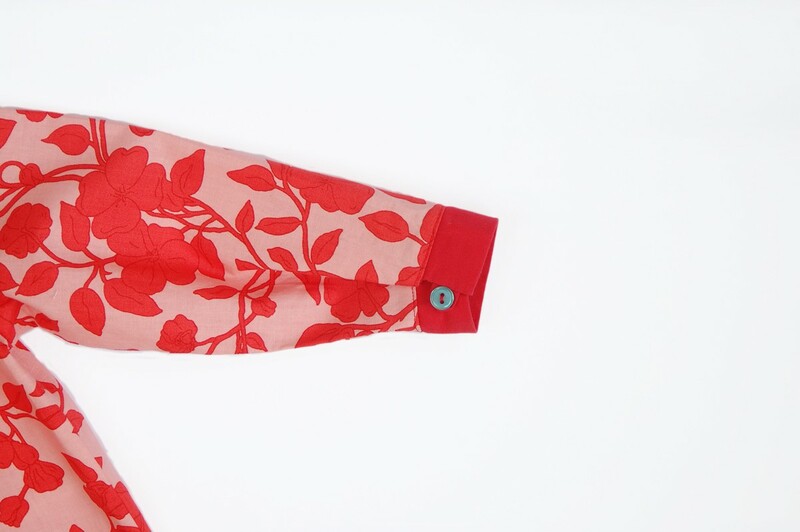 We also added our favorite really easy cuff with more of those cute button loops at the long sleeves so they can be buttoned and look more tailored but without the fuss of sewing a sleeve placket. The dress also has a classic shirt-style pleat at the back, and of course with all these great tailored shirt details we also had to include the shirt-tail hem. So of course you could also wear this dress as a tunic, with leggings or pants underneath like our house model is here while she works on her summer book report homework. 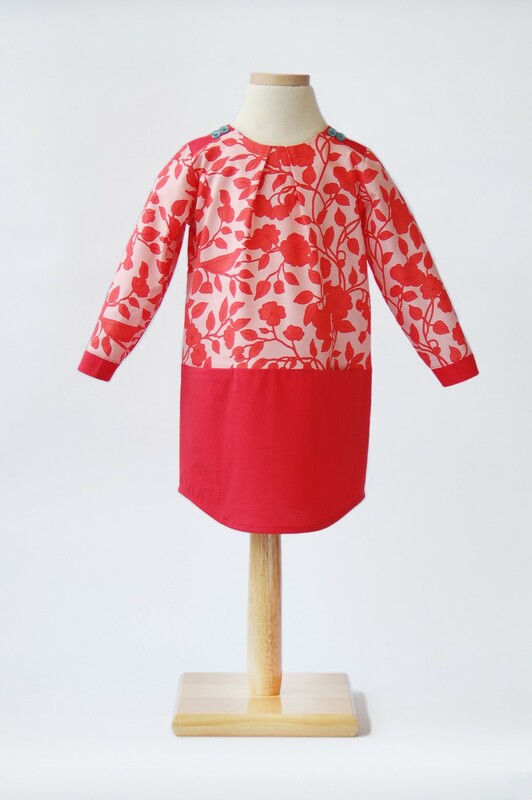 This dress is designed for quilting cottons, lightweight corduroy, or even stable knits. The pattern is rated two scissors in difficulty, so it’s a relatively quick and easy project to complete. And did you notice that there are no button holes? Yeah, I thought you’d like that. I was on the fence about this one until now. I love the bold contrast on the version S is wearing. As much as my daughter loves the fairy tale dress, I’m looking forward to making this one too! 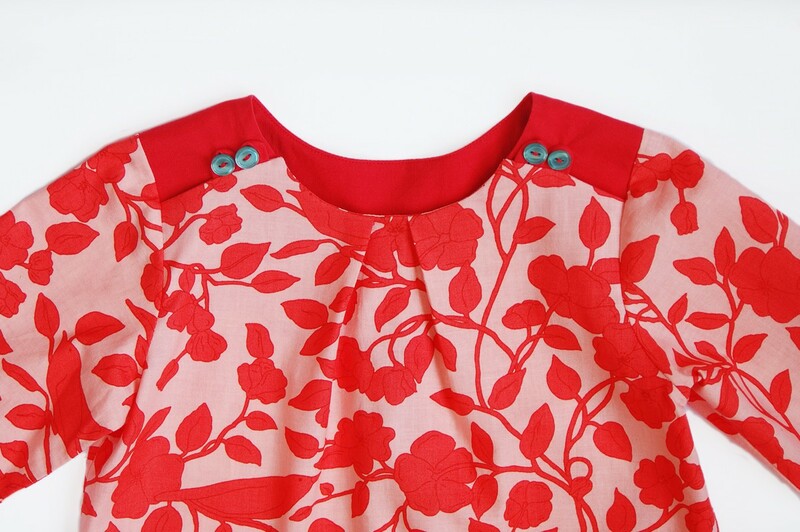 She’s a kid who prefers dresses so anything without button holes is fun for me! As much as I love a good fancy dress, this is my favorite of the new patterns. I always feel my sewing effort is somewhat “wasted,” (that’s a strong word but you get my drift), on a garment that will be worn once or twice. My daughter lives in dresses like this! This is the one I really want to make. You are a genius! Can I just say how excited I am about this one?! Thank you, thank you! Camille, I am with you. This one can be worn over and over and over again. This is my favorite. Can’t wait to make a few. Oooh I was looking forward to the detailed profile on this one! Looks like such a great fall everyday dress – I already have a couple ideas of how I’d like to make it! Fun. I love this dress – especially S’s version! I think I will be making thousands of these for my daughter this year. I like the sleeves and pockets on this, but I look forward to the line drawing. I’m having a hard time getting a grip on the design under the bold prints. I do like the shape with leggings – it could be comfortable and last a few years like that. I love this dress. How do I make it for myself? Love it! Can you tell me what the botanical/bird print fabric is? 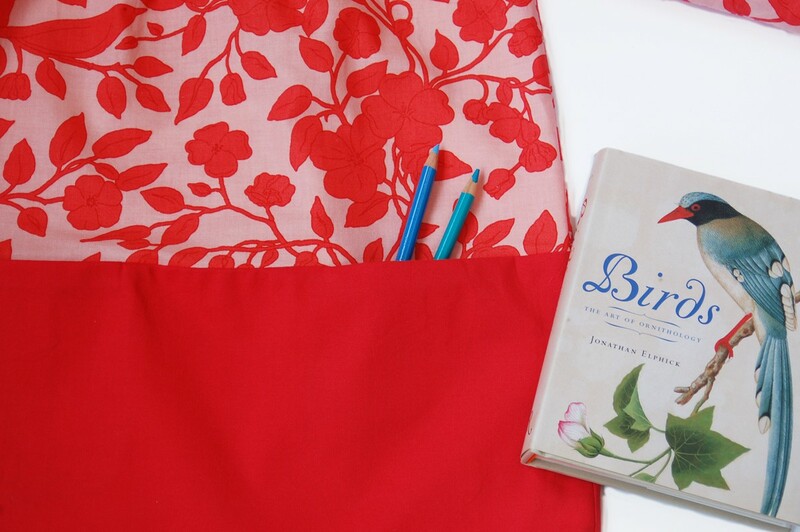 That’s a print from Liesl’s new fabric collection, The Ladies’ Stitching Club. You can see more in the Fabric section of the website. OH WOW! We’re big fans of O + S in our house, my daughter has 6 or 7 Ice Cream Sundresses (and your other separates… she mostly wears Oliver + S) and always wants more! I think she’ll love this dress the same, and I’m stoked that it has long sleeves (great for sun protection in the summer here in Oz.) Thanks for making another great little girl’s pattern.